A huge relief effort is under way to send vital aid such as tents and medical supplies to an earthquake disaster zone in a remote part of western China. 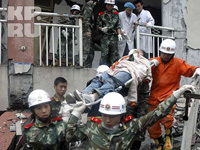 Over 600 lives were lost and more than 10,000 people injured when the 6.9 magnitude quake struck. Using their bare hands and shovels, rescuers continued Thursday to claw through the rubble of buildings that collapsed in a powerful earthquake in Qinghai Province, Voice of America reports . But as roads were cleared and the nearby airport put into operation, relief operations quickened with more than 10,000 soldiers, police, firefighters and medical workers now in Yushu county, where Jiegu is located, said Zou Ming, director of disaster relief with the Ministry of Civil Affairs. It appeared China was turning down offers of help from foreign rescue teams. Zou said the affected area was limited. "So we do have enough rescue teams," he told a news conference in Beijing, adding the offers of help were appreciated, The Associated Press informs.